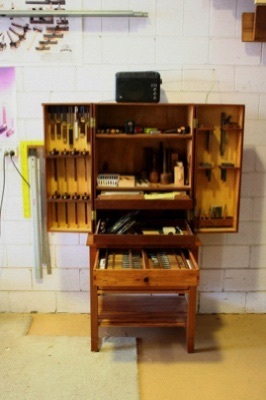 Classes in woodwork by someone with the experience to inspire whatever your skill level. A teacher with over 35 years experience and plenty of passion in a beautifully set up spacious workshop makes for enthusiastic students who just keep coming back. The classes are run in my shedudio in Sumner Park in the south west of Brisbane. The courses consist of one night a week for 7 weeks, - either Tuesday or Wednesday nights - and each class runs for 4 hours (6 pm to 10 pm). There is a maximum of 7 students in each class. Fine tools, including Colen Clenton squares and gauges and Japanese saws and very sharp chisels, are provided. The first course is structured to be a pretty rapid learning curve, but you may as well know now that you won't go home with some kind of box or a wobbly magazine rack at the end of it. This is because I believe that you're more likely to get competent/confident at accurate joinery by having the chance to do it again when it's less than successful, rather than by fretting over mucking up a project. ( We aim for truly gloatworthy results.) I supply the wood for this course. People who have never touched woodworking tools before are usually doing half-blind dovetails (like on the front of classy drawers) after this 7 weeks. Being an absolute beginner seems to be almost an advantage in that you have no bad habits to get over, but your skills will be refined no matter what your current level of experience. Each week I'll introduce you to a new wood, almost all Australian, and give pointers on the most effective ways of using various hand tools. Most lessons also include a session on such topics as understanding the nature of wood, construction considerations, sharpening, gluing, finishing and designing. We'll aim for a new joint each week, starting with halving joints and progressing to lap dovetails. In subsequent 7 week sessions you can take on projects of your own choosing. The workshop is very well equipped for power tools and machinery and I’ll help with the design as well as the practical aspects. I'm a woodworker because I love it (gawd knows it's not for the money) and I look forward to sharing with you the joy and satisfaction I find in woodwork, as well as whatever hints and tricks I've picked up in over 30 years as a self employed designer-maker. There is a bit of a waiting list so if you are interested please let me know and I’ll add you to it and call as soon as a vacancy comes up. I only run classes on Tuesday and Wednesday nights. I also run occasional Saturday workshops on making the most from the router.